Its a Wonderful Movie - Your Guide to Family and Christmas Movies on TV: "FALL"ow Lacey Chabert and Brennan Elliott as they film Hallmark Channel's Fall Harvest Preview Special! "FALL"ow Lacey Chabert and Brennan Elliott as they film Hallmark Channel's Fall Harvest Preview Special! 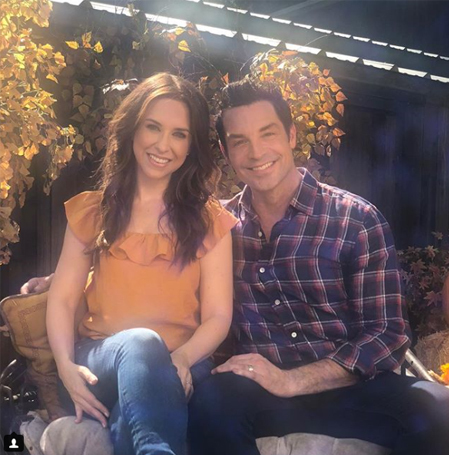 Before filming Movie #3 in the All of My Heart series, Lacey Chabert and Brennan Elliott worked together, once again, to film the Fall Harvest Preview Show - which will be highlighting ALL the movies coming to the Hallmark Channel - this Fall, 2018! Just like picking the right pumpkin, from the pumpkin patch, these two were the most perfect pick to host this fun event! Can't wait to see all the new movies coming around the corner! FALL-owing this... we are one step closer to Christmas! In a recent Instagram Story, Lacey showed a quick glimpse of the front page of the script for All of My Heart 3, and it definitely said "The Wedding" after "All of My Heart 3". So the title could change, but the story features someone's wedding, for sure! I didn't expect Hallmark to make the 3rd AOMH movie another Fall Harvest installment -- especially not if it involves their wedding. That is a surprise. I kind of expected it to end up as part of the next June Weddings event, or maybe even the Countdown to Valentine's Day (which is where the first AOMH movie premiered), or possibly even Christmas (I think that many of us have been hoping for an AOMH Christmas installment). But since Lacey and Brennan are the ones hosting the Fall Harvest preview (when Hallmark could have easily had one of their other regulars do it), it certainly implies that AOMH3 is a Fall Harvest movie once again. Yes, I was pleasantly surprised too that we would be getting All of My Heart 3 - The Wedding so quickly! I was also anticipating that it might be a Valentine's Day movie, like the first, or as you mentioned a June Weddings film, but this is even better... because now we don't have to wait! I am so glad they will be working together again. I love them both and I love their movies (especially when they are in them together). I just watched A Christmas Medley, just makes me smile! Thank you for sharing. Plus this special will mean fall/holidays/Christmas is around the bend! Yes, Lacey and Brennan are so fantastic together! It's incredible all the movies they've done with one another already! Lacey Chabert is my favorite! I love her movies. Thank you for the update. Oh, you're welcome! I know many of us are big fans of Lacey Chabert's Hallmark movies! All of them! Glad you enjoyed this news! Love these two, and especially together. Why in their 2nd movie the Inn was a different home? Yes, the B&B was different in the 2nd "All of My Heart" movie "Inn Love". It was, unfortunately, being used for another production at the time. I loved the first movie but didn't love the second one. Just didn't feel the same connection between the characters at all. Hopefully the third time will be the charm! Lacey is my favorite too. Lacey and Brennan are my favorite couple. I hope there will be another installment of their inn life, even after the wedding!